In the world of commercial trucking, Swift Transportation isn’t just one of the biggest names on the road, it is nearly synonymous with the industry of trucking. Within North America, Swift Transportation has one of the largest and most prestigious fleets around, including regional, intermodal, dedicated, recent graduate and student positions for drivers across the country of all experience levels and backgrounds. Though it is reported that drivers of all skill levels excel at Swift, those with experience do particularly well, often joining one of the several specialized fleets that swift has the offer. For those who have seen some miles on the road, Swift can often offer a yearly salary of $43,346, on average. While payment will fluctuate in some respects depending on the individual driver and their route, many report that Swift has never been a carrier that offers a relaxed salary for its diligent drivers. With a great deal of learning opportunities, a wide array of routes, and a company with the infrastructure in which to offer drivers a full network of support, Swift is often considered the leading carrier in the continent for several reasons. Many truckers prefer transportation because it is a known carrier to offer several different lanes and avenues for driving opportunities. Depending on one’s lifestyle, skillset, and relative need for financial compensation, Swift has a multitude of opportunities to fit the personal qualifications of a driver. report up to $40,038 per year. This figure has also reported to fluctuate based on the need for OTR runs set by a client or due to a specific time of year, for example. - Regional Drivers – One of Swift’s largest divisions is comprised of regional drivers who perform the duties and hauls that may be indicative of several different types of runs (think of a job that is semi-local, semi-regional, and, at times, semi-OTR.) Regional drivers frequently see a base salary of $38,843 per year for their hard work in these runs. How well are Owner-Operators Paid At Swift Transportation? At Swift Transportation, Owner-Operators are considered to be an elite crew of truckers who are highly esteemed and treated with the utmost respect for their dedication to driving. 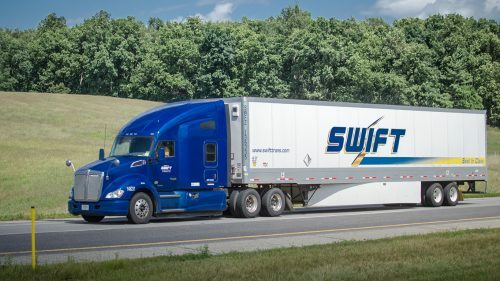 Swift acknowledges these drivers as some of the most important members of their overall operation, and is frequently recruiting this class of operators to join their growing fleet of independent truckers. As an owner-operator, a driver understands that they have the ability to succeed with multiple companies and names, and Swift is certainly one of them. Overall, many owner-operators find that they will take home a paycheck of $71,804 per year. To this end, Owner-Operators will find that the financial opportunities do not end at the average salary that Swift can offer an individual, as here are several other perks in which Swift can enhance the profitability of a driver. For owner-operators, Swift offers discounts on labor for trucks, parts for trucks and tires at Swift-specific company shops as well as many outside shops that Swift is partnered with. What Bonuses Does Swift Transportation Offer For Its Drivers? No matter what division that a driver chooses to join, Swift has multiple ways to pad the overall payment to a driver on top of what they are already earning for driving their assigned route. Mileage Bonuses: It’s not just about the miles that a driver takes on and completes at Swift, it is also about the acumen that Swift drivers display when on the road. Being on time, using fuel-efficient techniques and completing a great deal of miles will all help a driver see bonuses at Swift, which can easily boost one’s annual pay a great deal. Safety Bonuses: As one of the core principals of operation at Swift, safety is much more than a smart way in which drivers ought to operate, it is a necessary means for some of the most simplistic and intuitive ways for a driver to see immediate improvements to what they earn. In becoming more granular with the specific occupation one takes on, other pay bonuses may present themselves as well. 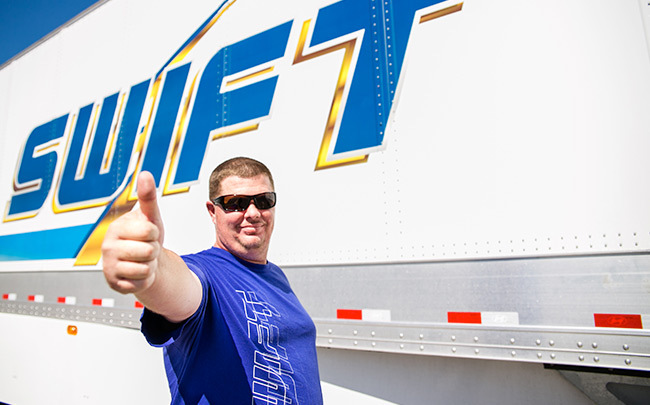 Swift is well known for its ability to provide prospective drivers new to the industry with a program that will help them get their CDL as well as give them the necessary tools to keep on trucking. With a transitional program that affords drivers the option to join swift after training is complete, drivers can certainly see immediate earnings, as well as some financial compensation from the company for their orientation to the world of trucking. At Swift Transportation, many individuals see a clearer path to the true figures that a trucker ought to be earning, with a direct line of employment that brings a student to a full-time position that can offer them close to $38,000 per year, depending on their exact job. In other words, students who choose Swift do not just sign up for training exclusively, they sign up for a most perfect “in” to a potential future career. While standard pay and bonuses are an excellent route in which to incentivize drivers and create an atmosphere of advanced earning and performance, Swift Transportation understands that may not always be enough to perform at the top of the trucking industry tier. To this end, Swift has consistently been a champion of implementing modern technology within their fleets and business practices to help with driver efficiency and aid with driver support. In creating a system where technology is embraced and recognized as an ally within trucking rather than an unnecessary burden, Swift Transportation has quite literally given drivers tools in which to ascribe to greater success overall.